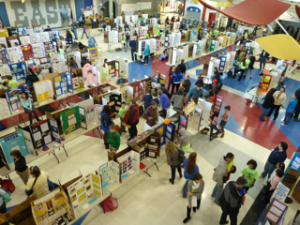 The 65th Annual Alaska Science and Engineering Fair (ASEF) will be held March 27-29, 2020 in Anchorage, Alaska. We invite all Grade K-12 students throughout Alaska to enter a science, engineering, computer science, or mathematics project in the fair. It is not necessary to participate in a local school fair before entering ASEF. ASEF is an Intel-affiliated fair. High school students compete for local and national awards and prizes, including the top award: A trip to the International Science and Engineering Fair. Middle school students are eligible for local and national prizes, and elementary students are eligible for local awards and prizes. The 2020 forms will be posted when they become available on the International Science & Engineering Fair site, typically in June. Please check back then. Senior High students, if you want to be eligible for the grand prizes, you must complete your forms before you do your research! The 65th Alaska Science & Engineering Fair will be held March 27-29, 2020 in Anchorage, Alaska. The 64th Alaska Science & Engineering Fair (ASEF), “React to Science”, was held March 29-31, 2019 at the Northway Mall in Anchorage, Alaska. ASEF would like to thank all the students, teachers, parents, mentors, donors, volunteers, and the Northway Mall for making the event possible. Last year’s senior high grand prize winners came back for a repeat of their exceptional performance, now sharing a tie for First Place: Savio Le, with “Implementation of a Novel Phosphate Absorbing Device for the Mitigation of Harmful Algal Blooms (HABs)” and Will Deering, with “Developing a Natural-Based Synthetic Honey Salve to Counter Water-Borne Surface-Wound Infections in Rural or Occupational Environments”. A student observer was also selected: Catherine Chen, with “What Kind of Bacteria Contribute to the Taste and Flavor in Fermented Tofu?” These students were invited to attend the International Science & Engineering Fair in Phoenix, Arizona, in May 2019. Pick.Click.Give and Fred Meyer Community Rewards: You can help fund ASEF! You may donate a portion of your Alaska Permanent Fund Dividend with Pick.Click.Give, http://www.pickclickgive.org/, search for “Alaska Science and Engineering Fair Inc.” in Eagle River. If you live in a community with a Fred Meyer, link your rewards card to us with Fred Meyer Community Rewards – https://www.fredmeyer.com/topic/rewards-3/#/community-rewards-4 – group 81550 “Alaska Science and Engineering Fair”. We would sincerely appreciate your support! Copyright © 2019 All Alaska Science & Engineering Fair.